Dramatify keeps your production information safe and backed up. Secure your production. Keep your information safe. Few can afford standstill costs due to crashed or stolen computers with production information that someone forgot to backup. Can you? Your production information is sacred to us. We are doing everything to keep it safe and accessible to you using industry best practises and professional hosting. Dramatify runs on professionally hosted servers in a secure facility, set up by security experts in Sweden with at least 15 years of experience in the field. All servers are kept within the EU. The administration of the servers, as well as the administration and access to your own production account by you and your team members, are done over encrypted connections to prevent eavesdropping. Administrative access of the server is granted using asymmetric keys. Our servers and their internet connections are monitored 24/7 for potential problems or unexpected behaviour. The data is backed up twice every day to two different physical locations to ensure its integrity if something should happen, and all the backups are encrypted. At least 7 previous versions are kept in storage to maximise security and accessibility. Dramatify is built on an open source framework with a world class security track record. All passwords are encrypted to prevent any security leaks. All users get logged out after a period of inactivity to prevent abuse. We take your production security very seriously! Dropbox is a great service. Many production companies rely on it, and we at Dramatify use it ourselves for some sharing. However, while it’s great for a small number of people to share documents with, customers have told us many horror stories of deleted or corrupted production documents when many users are sharing a production dropbox, leading to extra costs and delays. This is not something you can afford. A lot of standard production documents like screenplays, scripts, team lists, character lists, set lists, location lists, planning and call sheets are already incorporated features in Dramatify. Scripts are protected with a no-copy-paste function and drama screenplays have the additional protection of watermarking and print tracking. Dramatify also accepts other documents in a variety of common file formats. By design, we do not offer the effortless syncing of Dropbox that creates the problems of data corruption when many people open, save and close the same document. To delete a document in Dramatify, you must have administration permission. There is also no way you can delete the document by mistake, as is easy with Dropbox sharing if you are not completely aware of how the sharing works. 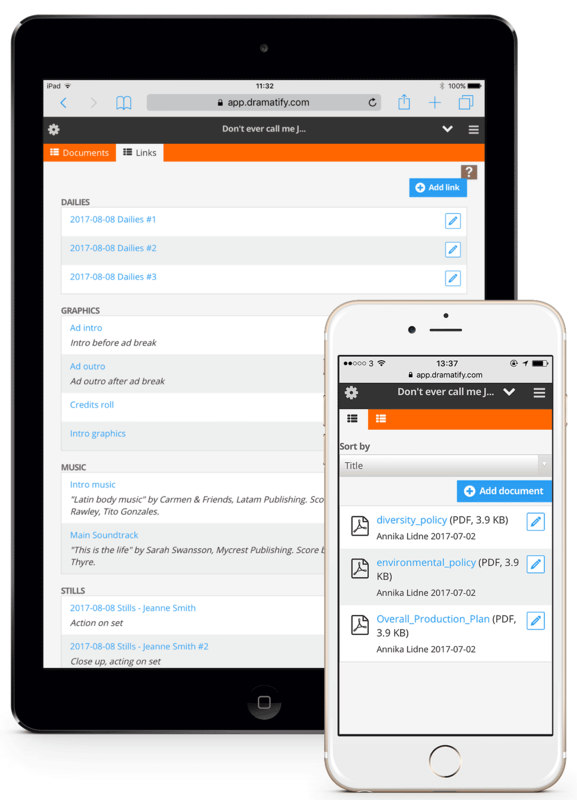 Thus, by sharing documents within Dramatify, you can be sure nothing is lost by mistake. We keep you safe. Professional hosting by security experts with 24/7 monitoring. Twice daily backups to two different, deep storage locations. Servers are kept within the EU. Encrypted connections between you and our servers. Top image by Stephanie Overton / Flickr (CC BY ND).